Resource management is straightforward and generic. After creating a resource server, you can start creating the resources and scopes that you want to protect. Resources and scopes can be managed by navigating to the Resource and Scope tabs, respectively. On the Resource page, you see a list of the resources associated with a resource server. From this list, you can also directly create a permission by clicking Create Permission for the resource for which you want to create the permission. Before creating permissions for your resources, be sure you have already defined the policies that you want to associate with the permission. Creating a resource is straightforward and generic. Your main concern is the granularity of the resources you create. In other words, resources can be created to represent a set of one or more resources and the way you define them is crucial to managing permissions. To create a new resource, click Create in the right upper corner of the resource listing. A human-readable and unique string describing this resource. URIS that provides the locations/addresses for the resource. For HTTP resources, the URIS are usually the relative paths used to serve these resources. One or more scopes to associate with the resource. Resources may have attributes associated with them. These attributes can be used to provide additional information about a resource and to provide additional information to policies when evaluating permissions associated with a resource. Each attribute is a key and value pair where the value can be a set of one or many strings. Multiple values can be defined for an attribute by separating each value with a comma. The type field of a resource can be used to group different resources together, so they can be protected using a common set of permissions. Resources also have an owner. By default, resources are owned by the resource server. However, resources can also be associated with users, so you can create permissions based on the resource owner. For example, only the resource owner is allowed to delete or update a given resource. Resource management is also exposed through the Protection API to allow resource servers to remotely manage their resources. 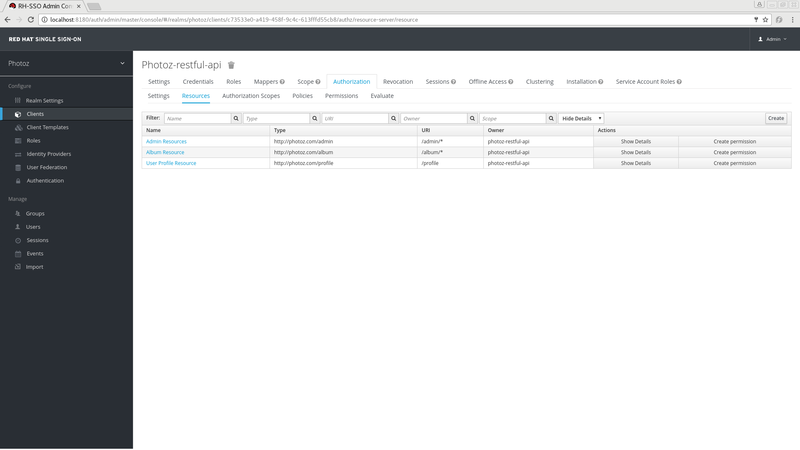 When using the Protection API, resource servers can be implemented to manage resources owned by their users. In this case, you can specify the user identifier to configure a resource as belonging to a specific user. 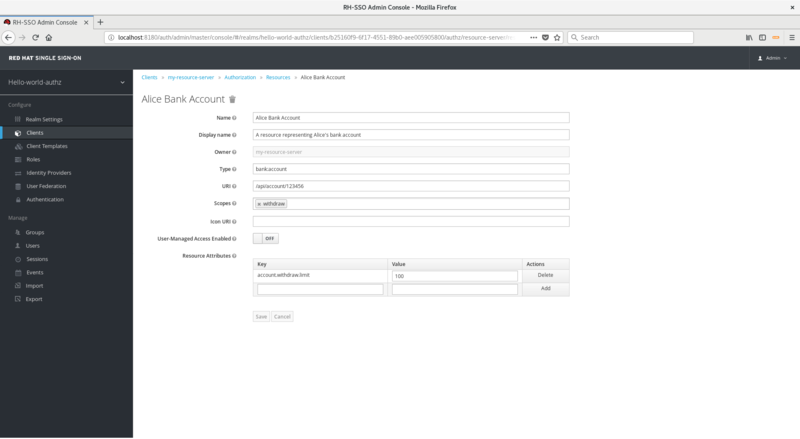 Red Hat Single Sign-On provides resource servers complete control over their resources. In the future, we should be able to allow users to control their own resources as well as approve authorization requests and manage permissions, especially when using the UMA protocol.